Lots and lots and lots of travel posts lately while I work on lots and lots and lots of new scrapbooking content! The roads getting to Kinsale were cray cray. Well, almost all the roads in Ireland were. They were incredibly skinny and bumpy and not nearly wide enough to accommodate two directions of traffic. But, we survived! 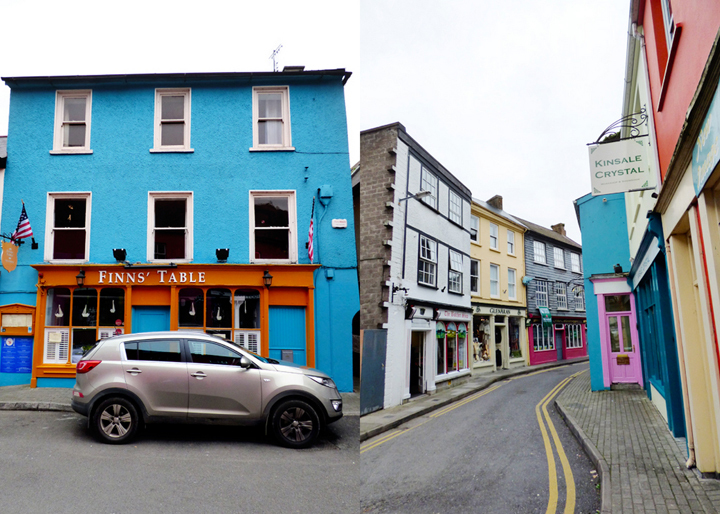 While nearby Cork is the biggest town in southern Ireland, Kinsale is actually more historic and certainly cuter. It's delightful to visit. 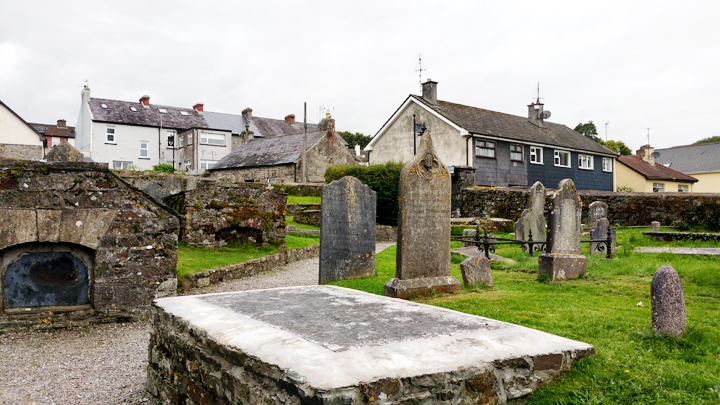 Thanks to the naturally sheltered bay barbed by a massive 17th century star fort, you can submerge yourself in maritime history from the Spanish Armada to the Lusitania. 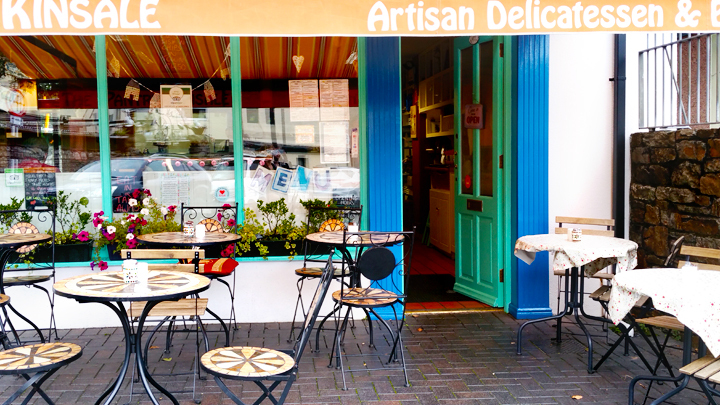 Apart from all the history, Kinsale has a laid back feel full of charm. St. Multose church dates from Norman times. There were marks on the door frame from back when worshippers would sharpen their swords on the doorway of the church. Darling cafe. The windy main street of town traces the original coastline. 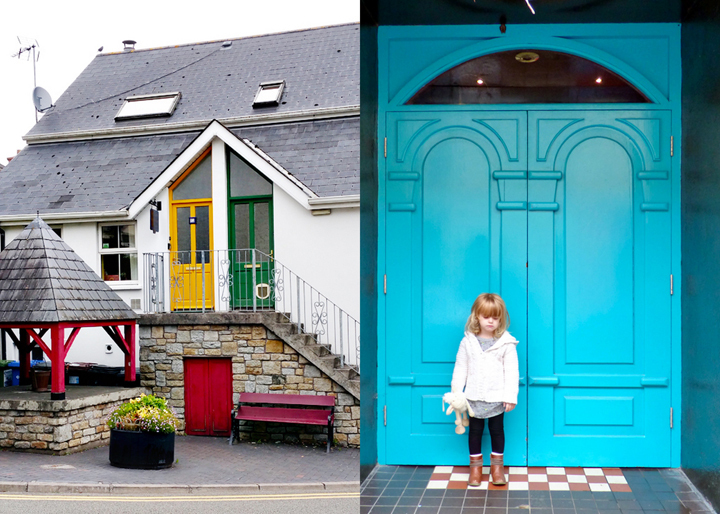 Colorful doors galore. Jane even begrudgingly posed in front of one. We wandered up and down all over the town looking for the spot I had seen from my google images research. And then... we found it! 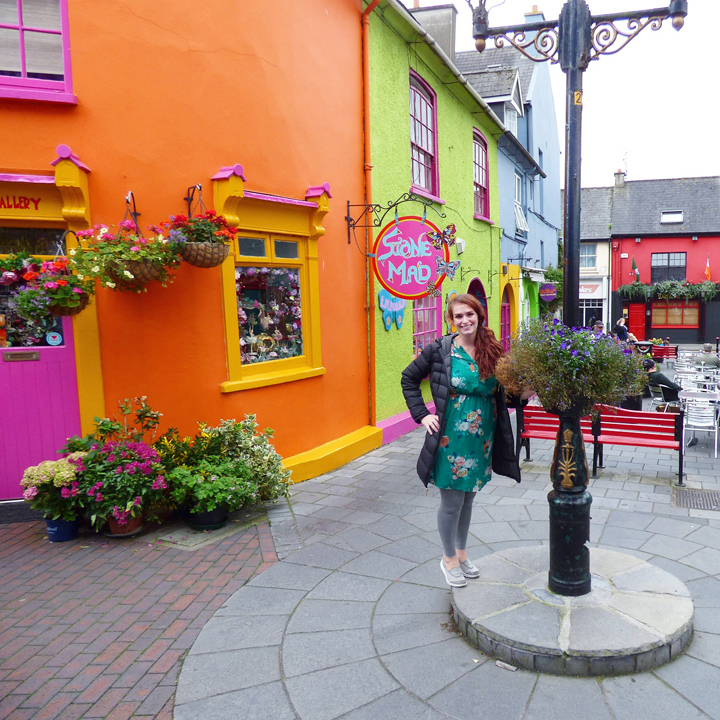 THE street I was most excited to see in all of Ireland! 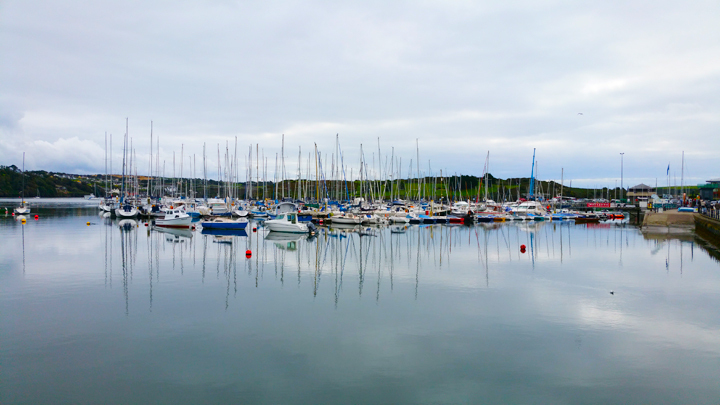 Our family in Kinsale, Ireland on Saturday September 19th 2015. We went into one of the cafes here to get a yummy nutella crepe and to enjoy the colorful ambiance. The history of the town was due to its protected harbor. But, eventually silt made it too shallow for the larger, newer ships so the shipping activity moved to Cork's deepwater port. The shipping business may have dried up, but the charm remained. It was a great town to just get lost in and explore. Not too big that if you got lost you couldn't find your way again. This is how we do. We got that double stroller on lock, rollin' deep. The harbor front, now home to private sailboats. As we were walking we spied a charming little fish'n'chips store which wasn't quite open so we let the kids play with the local wee ones at the nearby playground until it was lunch time. 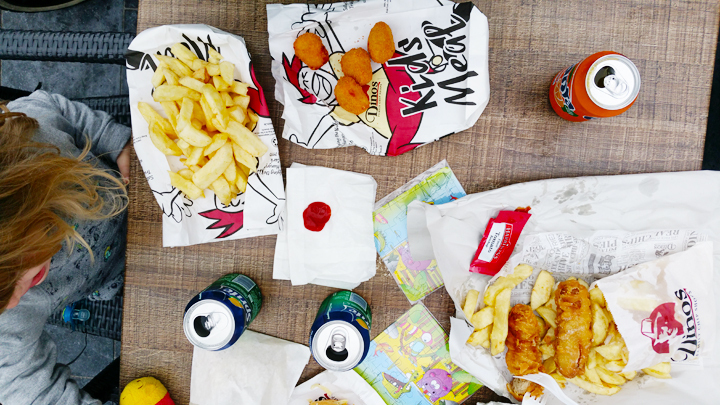 Since neither Chris nor I are fish people, we went for the battered sausages and chips and the kids got chicken nuggets. It was delish! I mean, what could be better than deep-fried sausages? At the next table over from us, two locals were going back and forth about how delicious the fries... I mean "chips"... were. "These chips is pretty good, innit?" "Best chips I've eva had." lol. They were excellent, especially with the vinegar and salt added. What a gorgeous town! I loveeeeeeeeeee the colors of those buildings!! WOW!!!!! Salt and Vinegar fries! I'd be down for some of that! Thanks so much for the tour! 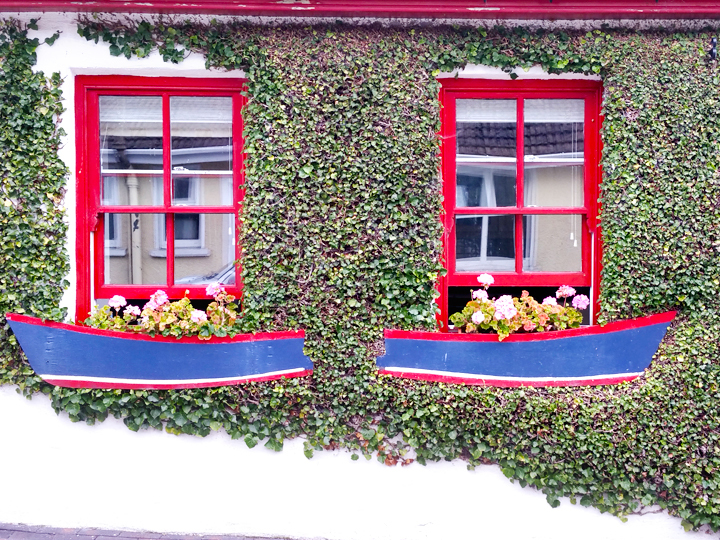 Kinsale is so quaint and lovely!